Outlook PST is a personal folder file that saves personal information stored in your system. These PST files can be protected or secured by a password. As Outlook allows to setup password protected file, so that it can be secured from an unauthorized person. However sometime a user forget the Outlook database file password and unable to access it. But Microsoft does not use strong encryption and you the user can access file again with software. PST can be retrieve through decrypting 32 bit CRC32 hash password value. When you open PST file it checks hash value and if it is 0 the file will open without password prompt. But if the entered character is something else than the password prompt will pop up. 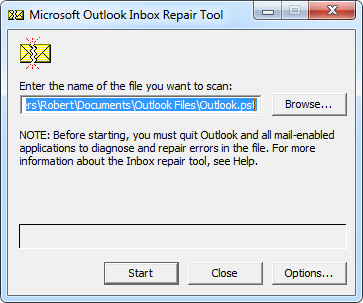 Microsoft Outlook also provides an inbuilt feature to recover encrypted PST files. It recovers the corrupt PST file emails and other items to some extent. Locate Scanpst.exe utility on your system as it various according to version of Outlook and Windows. The path is also revealed in startup error. Open Scanpst.exe utility and browse the PST file you want to recover by clicking on "browse" button or manually typing the path. After that click on "start" button scanning process started and after completion of it you can view the detail by clicking on "Detail" button. Repair PST file by clicking on "Repair" button (if the PST file is large it take time otherwise the whole recovery process get finished in few minutes). If Scanpst.exe fails then, use an apt solution in the form of commercial tool which helps you to repair encrypted Outlook PST files and provides you instant result. 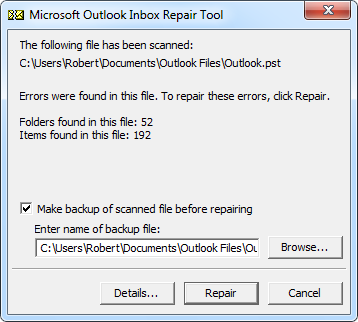 Repair Encrypted PST: Use Outlook Recovery tool to repair encrypted Outlook PST files and fix query like How to fix Outlook error. 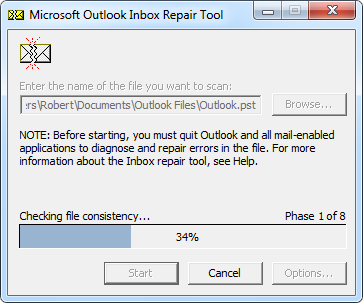 With the help of this Outlook PST repair tool, you can repair Outlook PST data with in short time. This tool is amalgamation of high technology and utter ease so that, both technical and non-technical user can scan out this repair encrypted PST process effortlessly.